Audrey Elisabet: Excuses and school. 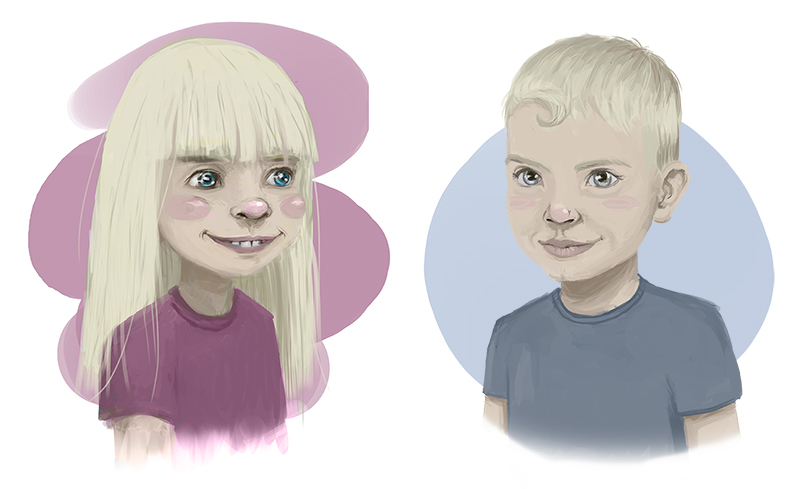 Helena and Þorsteinn - Portraits done a year apart of Marinó's niece and nephew. I've been extremely busy lately! School is taking up so much of my time and Ylfa is becoming so quick that I have to be constantly on the run when I'm at home. When Ylfa sleeps I have to do homework and if I find any spare time in between I work on some commissions. I have two wedding invitations that I am working on and one confirmation invitation, so I have a lot to do besides school. But I promise I will try to put up a blog as often as I can! School is really fun. I have two figure drawing classes, one is just basic figure drawing while the other has more of a focus on the bones and muscles. It has been a little challenging starting to draw again, but I can feel it getting easier with every drawing I do. The last drawing of the class yesterday was not a complete mess, so that's something! I'm also doing two classes online. One is astronomy; the calculations and science talk is really giving my brain a workout. The other is composition for the artist. One of our first assignments in composition for the artist is to write our autobiography. It is a little scary to write your own autobiography, especially because we are supposed to post it in a discussion thread for everyone to read. I started mine last week and I kind of enjoy it even though it is a tough thing to do. Maybe I will post the finished product here later this semester.. If it's not too embarrassing.